I am writing an exam using the exam document class. In the exam you only need to answer 10 out of 12 questions (10 points each question). When I create the grade table with the command \gradetable, the total number of points is 120. 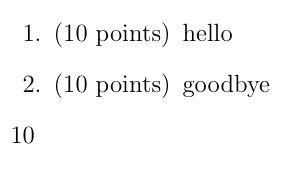 How can I manually set the total number of points to 100? I don't think that this is possible without changing the class file. Since exams with the structure that you describe are pretty common, it might be worth emailing the author of the class to request that he adds this feature. will do the trick. Exactly where the change needs to be made depends on the type of gradetable that you use. A bit of trial and error may be needed. After a quick back-and-forth with the class author and maintainer, he added the requested functionality and posted the beta version on his website. Please check and report back (here or directly to him) if there is any trouble. % actual total number of points in the table. % for all of the questions. I think that that this is what you wanted. Use Bonus Points for the two last questions (changing the text so that it seems the same) then they will not get added. Alternatively, I think that you can turn off and then back on the summation of point, but this is all from reading the manual...never actually tried it. Not the answer you're looking for? 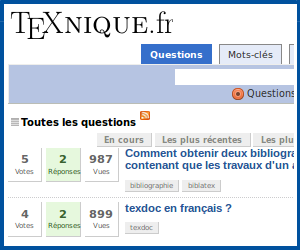 Browse other questions tagged exam or ask your own question. Exam Class - Automatically print a partial grade table on each page?